The outer layers of the board are commonly referred to as the ‘face’ and ‘back’ and are graded based on quality. The intermediate layers are collectively known as the ‘core’. Plywood glue is produced and tested for suitability in interior, humid and exterior applications. The 2012 edition of EN 636 retains the designations -1, -2 and -3 from the previous three part standard to represent dry, humid or exterior conditions of use. Dry Conditions: For interior applications with no risk of wetting, deﬁned in Use Class 1, with a moisture content corresponding to environmental conditions of 20°C and 65% relative humidity. Humid Conditions: For use in protected exterior applications as deﬁned in Use Class 2, with a moisture content corresponding to environmental conditions of 20°C and 85% relative humidity. Exterior Conditions: For use in unprotected external applications, as deﬁned in Use Class 3, where the moisture content will frequently be above 20%. EN 636 also introduces bending strength and modulus of elasticity classes based on bending tests to EN 310. These give a designated strength (F) and modulus (E) parallel and perpendicular to the face grain. A general purpose (non-structural application) plywood sheet must be tested to EN 310 and meet the minimum values recorded in EN 636 (F3 & E5). 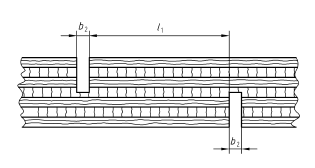 These characteristic values for a panel intended to be used in structural applications must also be tested to EN 789 – Determination of mechanical properties of wood based panel products (or derived by cross-referencing EN 12369-2). EN 789 tests bending, compression, tension, panel shear and planar shear; this makes it much easier to obtain design values when specifying plywood according to Eurocode 5. Plywood is produced with glue bonds which range from those suitable for interior uses only, to those which will withstand full exposure for long periods. In line with EN 314 (parts 1 & 2), bonding quality is determined by pre-treating samples and conducting a shear test with a tensile testing machine. Samples have to be prepared with ‘nickings’ made through to the core veneer of the plywood at each end of the sample (see image). Class 1: Dry conditions (interior, dry uses). Class 2: Humid conditions (protected external service, ‘damp’ internal uses and limited exposure during construction). Class 3: Exterior conditions (exposure to weather over substantial periods or continuous exposure to relative high humidity). Class 3 bonds are a requirement for plywood to comply with BS EN 636-3. The bonds are largely comparable with what were known as WBP – weather and boil-proof bonds (to BS 6566 Part 8, now withdrawn), except that the requirement that effectively they be made with phenolic-type glues has now been dropped. To qualify, the bond must now meet the stipulated test requirements. For full phenol glue bonds, the pre-treatment method for exterior conditions listed below can be used with the 72 hour boil test (indicative of WBP) can be used as a test of confirmation. Immersion for 6 hours in boiling water followed by cooling in water at 20°C (± 3°C), for at least 1 hour. The specification of wood based panel products using EN 636 and the harmonised European standard EN 13986, serve not only to determine the performance of wood-based panel products, but also align their intended use with Eurocode 5. The Eurocodes are a collection of standards that provide a common framework for structural designers, allowing them to comply with national building regulations throughout the European Economic Area. Eurocode 5 (EN 1995) focuses on the design of timber structures in particular, and is to be used in conjunction with EN 1990 (Basis of structural design) and EN 1991 (Actions on structures) in order to employ the correct rules and formulas to produce a compliant specification. Please click here for more information on Eurocode 5 provided by TRADA. A diverse and multi-faceted range of Hardwood Plywood products, carefully sourced and suitable for a wealth of applications. Plywood sheets comprising birch veneers throughout which produces the most versatile of products. Suitable for applications; general construction, defined engineered structures, decorative panelling/furniture etc. PEFC™ and FSC® Certified. Combines significant weight saving with high quality faces. Extremely accurate thickness and dimensional tolerances. A collection of practical panels comprised of coniferous tree species and created with structural purposes and applications in mind. A collection of polyester, patterned and phenolic film faced plywood. Panels manufactured primarily for forming concrete structures.